​​The Geographical Society of Ireland is delighted to be the hosts designate for the International Geographical Congress 2024 and looks forward to welcoming the world to Dublin in 8 years time! The International Geographical Congress (IGC) is the largest international gathering on geographers in the world. It takes place every four years and is sometimes referred to as the Olympics of Geography. As well as academic paper sessions, the congress includes a range of other activities including keynote plenaries on topics of major international importance, workshops for early-career researchers, field excursions in the host country and the Geography Olympiad for high-school students. ​In December, an open call was issued for applications to host IGC2024. The Geographical Society of Ireland, which has a core goal of enhancing the international reputation of geography in Ireland, submitted a bid to host the event in Dublin and was competing with bids for Copenhagen/Malmo, Melbourne and Prague. 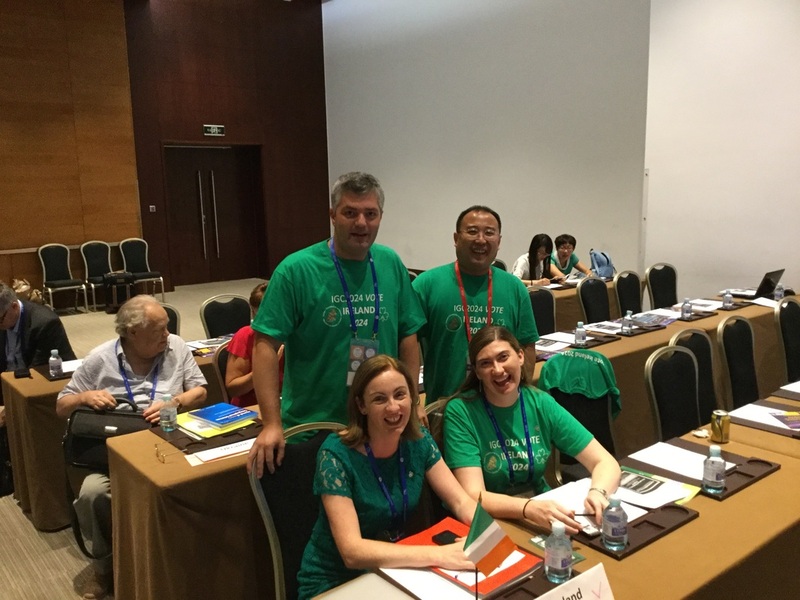 The bid was led by GSI President Niamh Moore-Cherry working with Frances Fahy and Gerald Mills (Vice-Chairs), with the strong support of Anna Davies and Rob Kitchin (Local Organising Committee members), Jonathan Cherry (representing the proposed venue of DCU) and Zhao Zhang. Martin Sokol and his colleagues in the Financial Geographies Network provided excellent support during the lobbying in Beijing. Following 8 months of intense preparation and work, a series of presentations were made to the IGU Executive Committee and to the General Assembly meetings held in Beijing during the IGC 2016 (21-26 August 2016). Following a vote by the General Assembly, made up of national contact points from member countries, Dublin emerged the decisive winner. Sincere thanks to the Irish Embassy in Beijing who were extremely supportive and hosted a “Taste of Ireland” reception for our international supporters. The Geographical Society of Ireland also wishes to formally acknowledge the support of our international scientific committee, Keynote PCO conference management company, as well as organisations/institutions who strongly supported our bid: Fáilte Ireland; Royal Geographical Society-Institute of British Geographers; Regional Studies Association; Journal of Geography in Higher Education; Dublin City Council; Dublin City University and all Geography Departments on the island of Ireland. Now the hard work begins to make IGC2024 a true festival of geography and IGC to remember!